One of the most refreshing, elegant tops we've seen this season, it features an ingenious stand-up collar that doesn't lose its shape thanks to the built-in wire (think of your favorite crushable hat). Creating a flattering, feminine ruffle along the neckline, it will add a regal touch to your outfit. 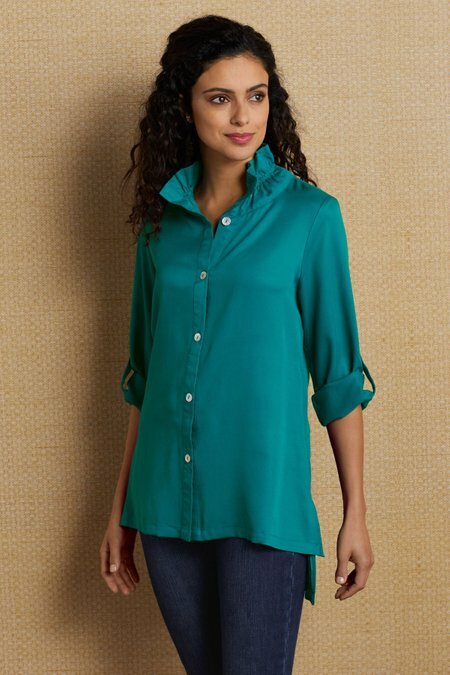 Button-tab 3/4 sleeves, side slits, and two decorative buttons at the vented back hem. Tencel® Lyocell. Misses 28"/29-1/2" long.